Tucson, AZ, WPH Press, 10/26/16-The first Race 4 Eight event of the Race 4 Eight 6 season produced the fourth different Men’s R48Pro winner in the last five Race 4 Eight events, as Ireland’s Robbie McCarthy captured his third R48 title in his six R48 starts. 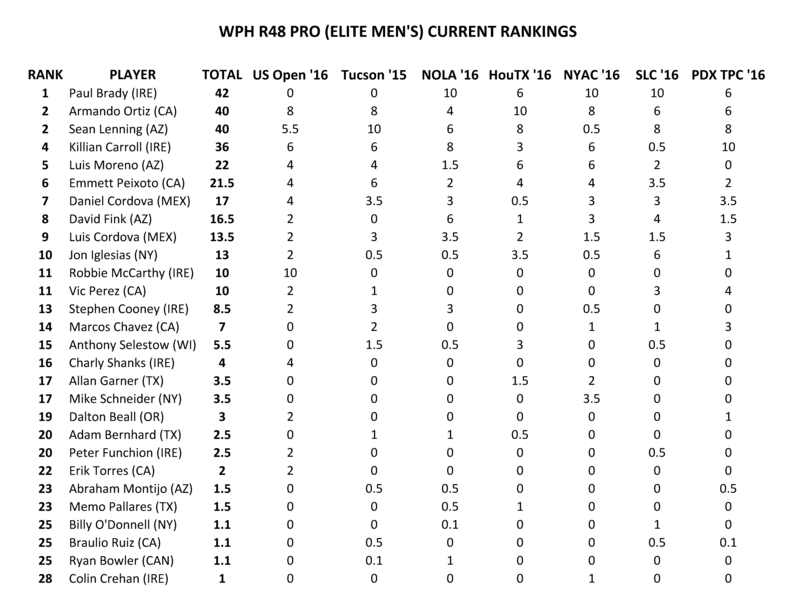 Mando Ortiz and Sean Lenning are now tied at #2 in the rankings, and with Paul Brady not playing in Minnesota, a coin flip between Ortiz and Lenning will determine the #1 seed in Minnesota at the next R48 stop in November. Catriona Casey won her 10th WR48 title in 11 starts, remaining the dominant WR48 #1. Marcos Chavez won his fourth SR48 stop in his last five SR48 starts and has become the dominant SR48 #1.